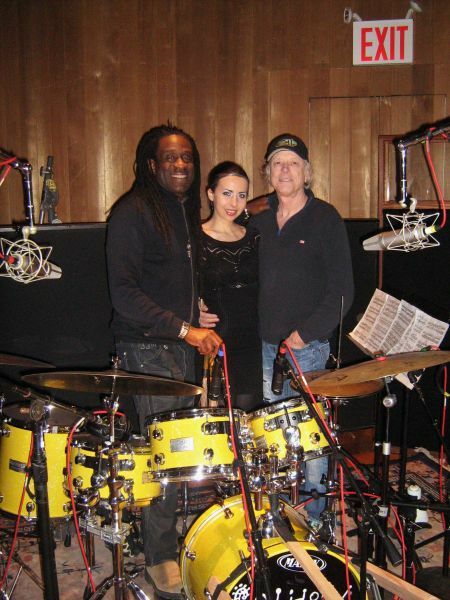 Will Calhoun, Tania Stavreva and Ron Saint Germain collaborate on the album, Rhythmic Movement. Bulgarian-born virtuoso Tania Stavreva is getting ready to release her debut album on Jan. 7, entitled, Rhythmic Movement. This naturally gifted pianist has a unique contemporary classic style, influenced by a variety of artists ranging from composer Vladimir Horowitz to the The Beatles and Aretha Franklin. Based out of New York, Tania has been making a name for herself playing at places such as Carnegie Hall and Lincoln Center. She’s been seen sharing the stage with legendary bassist Ron Carter, the Miles Davis Family as well as GRAMMY Award-winning songwriter Mike Stoller. Tania is one of the first pianists of her generation to perform modern classical music at mainstream rock club venues such as Webster Hall. Her collaborations with drummers Will Calhoun (Living Colour, B.B. King) and Dave Lombardo (John Zorn, Slayer, Fantômas) have officially landed her in a completely new genre of music. AXS had the opportunity to speak with Tania to learn more. AXS: Tell me about your debut album, Rhythmic Movement? Tania Stavreva: It’s a project that is very dear to my heart. The album is different because it’s not the typical classical album. It’s got a modern edge and I think part of that I got from living here in the United States. I get to hear about various cultures that encompass jazz music and rock music in a different way than I would have in Bulgaria. I mostly selected rhythmic and melodic pieces for the album. I wanted it to feel like a dance. I think more than anything I like to work with my imagination. AXS: Do you have a dream collaboration that you would like to do? TS: That’s hard to say because a lot of my dream collaborations actually happened in real life and I didn’t plan them. For example, getting to work with Dave Lombardo, who’s the drummer from Slayer. We met at the GRAMMYs back in 2011 and I sent him some of my music. Metal in general is not a genre I follow closely but I like certain instrumentals. I had never heard percussion music in that way. Another dream collaboration is Will Calhoun, who’s the drummer from Living Colour. When you feel the chemistry, it’s hard to compare it to anything else. AXS: Tell me about what it’s been like working with legendary producer, Ron Saint Germain? TS: Ron is another dream collaboration of mine. I met him when I moved to New York and he came to one of my concerts. At the end of the day, it’s really about the chemistry of the artists; of the people who are working together. That’s the main thing. And to have people like Ron and the others working on this, people of such high caliber who are supporting me in this project, it’s really an honor for me. AXS: What do you hope people who listen to your music will take away from it? TS: I didn’t really make this album expecting something. For a long time I didn’t even want to get into the process of making an album and dealing with record labels. But I started to learn that people would come to my shows and want to take my music home and share it with others as a gift. So, when I finally decided to record this album, I needed to really figure out what I wanted to say and how it related to me personally. I feel that where I am in my own life, I need a rhythmic movement that gives me some kind of drive. Some kind of happiness. This album has an energy that makes people want to keep moving forward. A lot of what inspires me about music is seeing how dedicated artists are to their work and how they connect with the audience. It’s all positive energy and that was something I could gift to people. It’s why I decided to select the music in the specific order I did. I wanted each track to be connected to each other. To lead from one story to the next. The next part of Tania’s own story will be going on tour. Her album, Rhythmic Movement, is being released completely independently. You can find it for sale on her website.